This summer we have been traveling back and forth to our vacation home since we have tons of work to get done. One thing I didn't think to have as a staple in our vacation place was a thermometer. 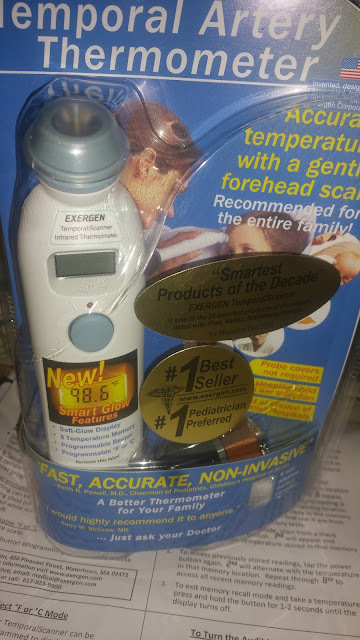 Thankfully Exergen sent us the Temporal Artery Thermometer. This thermometer may be little but it packs a great punch. I love that I no longer need to wake the kids in order to take their temperature. All I need to do is slide the thermometer is a straight line across the forehead between the eyebrows and the upper hairline in order to get a reading. Having a thermometer on hand wherever you go is a must with kids and the Exergen Smart Glow TemporalScanner™ Thermometer is small enough to fit pretty much anywhere. Retailing for $49.99, this awesome thermometer can be found at Walmart, Babies R Us, Target and other retailers nationwide. 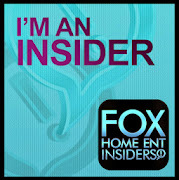 Party of 5 is giving away an Exergen Smart Glow TemporalScanner Thermometer to ONE lucky reader! We are going to Disneyland in October. I would take it with me just in case! I would bring it to the Lake, on vacation, and to work. I never know when I could need this thermometer! I would take this with me everywhere to shop and to grandmas and on vacation! I would take it on our big family beach vacation every year. SOmeone always gets sick! I would take this with us whenever my family and I either travel or away from home. Just this past month, while traveling and staying in a hotel, both my sons had gotten sick and we didn't have any way of checking their temperature. Wish we had thought to bring one of these along. I would give it to my friend's daughter as a baby shower gift. I would bring it along on day trips. And of course on vacation. i would bring it everywhere. better safe than sorry, right? I would use it as a baby shower gift--we already have one, and it would be a very nice thing to have for a new mom. I would keep it at home but take it with us on trips. I would use it everywhere. I would use it at home, when we travel and when we have to move again and drive to our next military base. I would actually gift the scanner to my brother for my nephew. anywhere we travel too or daytrips.